I have been wanting to learn about making rings and stone setting for a long time but other techniques always kept grabbing my attention first. 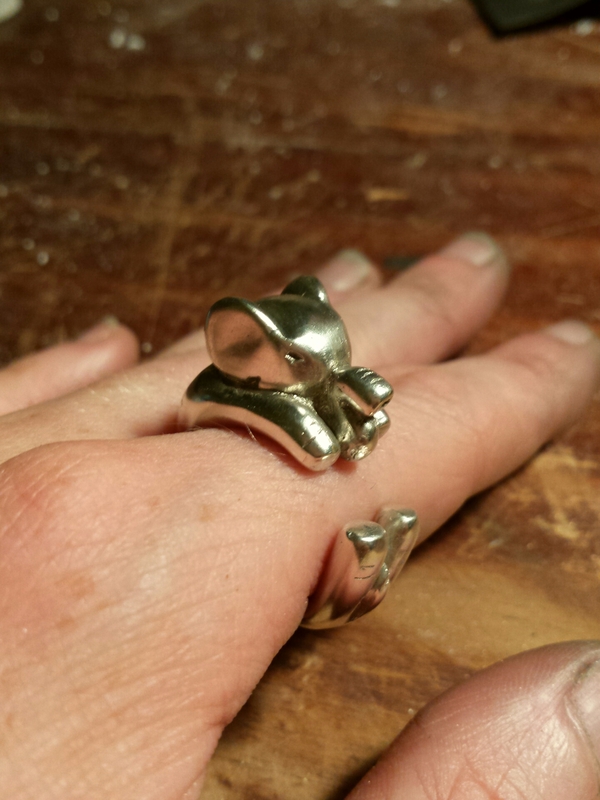 But finally I had the pleasure of taking a three week ring making workshop for school. And it was amazing! Sterling silver and denim lapis tree ring. My final ring for the class, probably soon to be made as a pendant, too! And exhausting! For ten hours a day Monday through Thursday and as much time as I could find around my part-time job on the weekends I was immersed in all things rings and settings. I’ve had this tiger eye since I was little and always dreamed of making it part of a ring. Dream come true! This was hand cast with into the cuttlebone of a cuttlefish giving it that beautiful texture. Pouring molten metal is still one of my favorite things! It was an intense challenge but worth every ounce of effort ten times over. Part of the challenge was the sheer number of projects. One of the simpler rings I made in the class. I’ve always had a thing for feather rings! In eighteen days I managed to make twelve rings, two engraving tools and a sample gypsy setting. It was amazing to see how much I could accomplish in a short period of time once I truly applied myself. I was a little scared of breaking this shell before I set it, but it went perfectly! This little guy is probably my favorite. I’ve been wearing him everyday since I finished him! For everything I did there is more that I look forward to experimenting with and practicing over the rest of summer and beyond. Several of these rings are now available through my etsy shop with more on the way! Check it out and get a handmade ring of your very own!